Art it Up. This is a weekly meme hosted by Tabitha over at Not Yet Read. The idea being to see if you can come up with some inspiration for a little sketch or doodle from your last week’s reading or just anything else in general. this week I’ve been reading Atlanta Burns by Chuck Wendig and The Ice Twins by S K Tremayne. 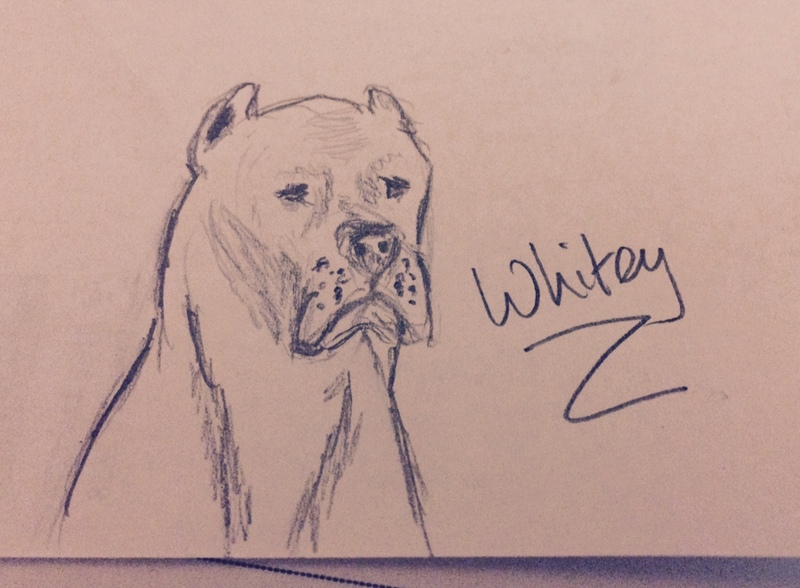 I’ve taken my inspiration from Atlanta Burns and tried a sketch of Whitey! The Topic for Tough Travel at Fantasy Review Barn this week was Law Enforcement. Check out this week’s books! Check on over to Tabitha’s place – her artwork is always quite gorgeous!! That dog looks so sad! And thanks for the compliment dear you are so sweet! They have that kind of look – it makes you want to hug them to cheer them up!